My friends and I in the journalism community were stunned yesterday by the news that Ed Blochowiak, the photographer at the Shawnee News-Star with whom I worked for three years in the 1980s, died Sunday. For years after working with him, I saw him in the field at events we both covered, and I was always glad to see him. He just retired in July. Sad news. I saw my doctor yesterday for my semi-annual checkup. I got an influenza vaccination, a cortisone injection (for my achy-breaky back), and gave them a routine blood sample. From that, the lab did a lipid panel, a CBC, and a comprehensive metabolic panel, which I read this morning on my mercy.net. Every value on every test fell within the standard range. Add to that the fact that in the past 18 months I have lost 14 pounds, and today I am feeling pretty good about my health situation. How did I lose 14 pounds? I have been amping up my activity levels whenever possible, and making an extra effort to stop eating when I am full even when there is still food in front of me. My diet has included more fruit than before, and I have been a vegetarian since 1989. But it’s more than just those choices. It is a fundamental attitude about food: I eat to live. I don’t live to eat. 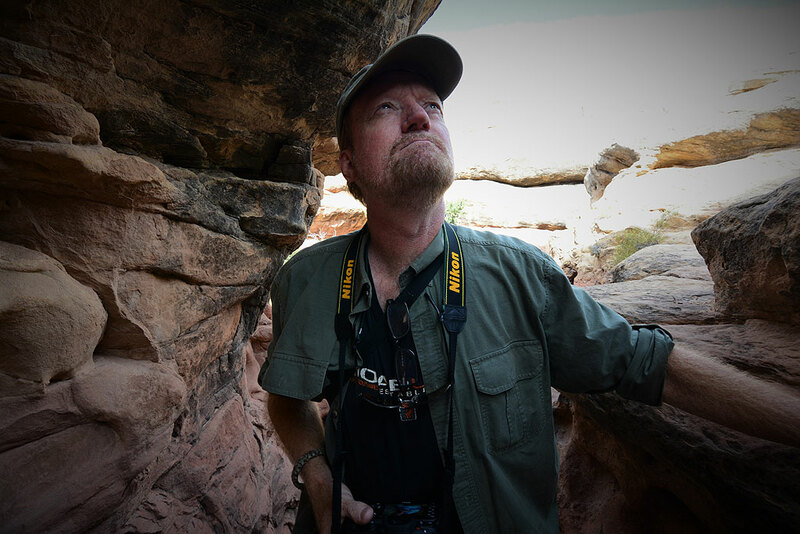 Scott Andersen made this image of me hiking at Canyonlands National Park, Utah, last week. Much of my self-image is connected to this type of activity. Good to have met him. He had some real old world knowledge. Ed’s absence from us is a loss.